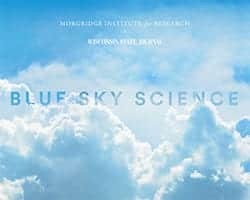 News & Stories > Blue Sky Science > How do animals evolve and get new traits? Whether it be animal or plant, bacteria or fungi, there is one organism that gave rise to all those types of life. All those different types of life are products of selection based on behavioral or physical traits. This natural selection was first described by Charles Darwin in “On the Origin of Species.” At the time, Darwin didn’t understand the molecular mechanisms for the selection, but he was able to observe the trend of change over time. The foundation of variation is based on genetics, or alterations in the DNA called mutations. Different types of genetic mutations arise in an organism. There could be a single DNA change or a whole sequence of changes. Genes could be deleted and go away completely, or genes could be duplicated. Any one of those mutations can alter an organism’s traits or phenotype. These traits are heritable, meaning it can be passed down to future generations. An organism with a beneficial trait that gives it more success than its relatives, will be more “fit.” This means it will reproduce more successfully, and its offspring will also possess that beneficial trait. The animal’s environment determines how healthy or successful that animal is. A healthy and successful animal is able to reproduce and pass those successful traits onto its offspring.